Avaunt Magazine invites the reader to escape the urban grind. Featuring extraordinary people from around the world. 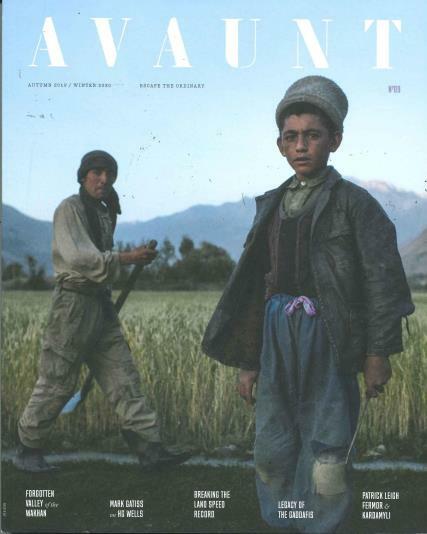 Avaunt Magazine completely dedicated to supplying you with incredible feats of adventure. All of the features within Avaunt Magazine tend to go beyond the realms of what mainstream media would ever consider covering. No matter how unusual the story you’ll always be surprised by a great story. Buy a single copy or subscription to Avaunt magazine. Avaunt Magazine covers stories directly from the writers and thinkers that are on the frontlines of innovation. Whether that be in the world of technology, music or science. Avant has two issues per year, giving you a thoughtful insight from the pioneers and innovators who shape the world. If you have a thirst for the unusual, that you're yet to clinch then, Avaunt Magazine will be able to fill your curiosity. Whether you're wanting to know about the latest ground-breaking discoveries in technology or even about the world’s most remote island. One thing for sure is that Avaunt Magazine will satisfy your restless imagination. Avaunt’s passion for adventure and the unusual is reflected in its coverage art of style.